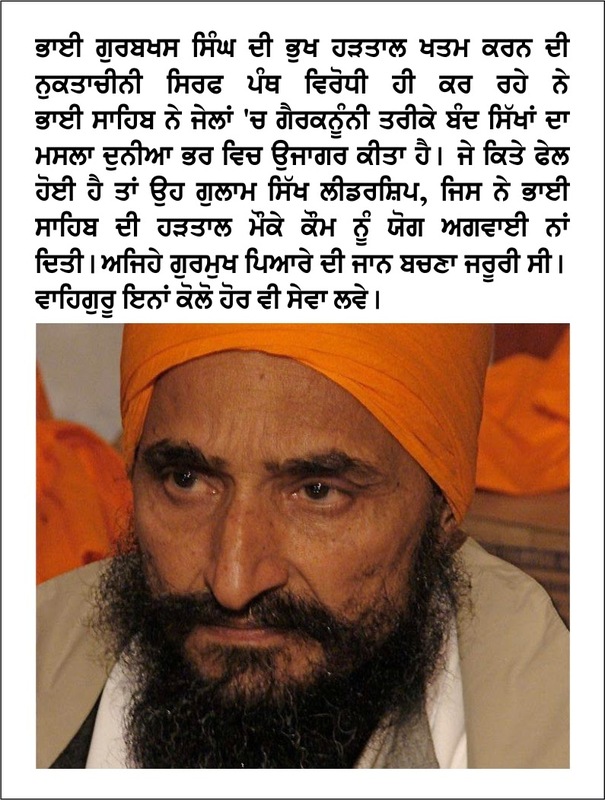 Bhai Gurbaksh Singh has highlighted the plight of Sikh prisoners who are not being freed despite having served the jail terms. It is good that he has no abandoned fast after 64 years otherwise we would have lost him for ever. Now only enemies of Panth are criticising him as to why he abandoned fast and why he didn't die? We ask such people that if they are really well-wishers of the Panth they should themselves undertake such a fast unto death. We are happy on the decision of Bhai Sahib. However we regret to point out that it is a utter failure on the part of Sikh leadership who kept itself aloof from the fast of Bhai sahib. Had the leadership supported Bhai sahib we would have been a winner and prisoners would have been freed. The Sikh leadership exhibited a character of slaves.